Postfity was created to manage your time more successfully. It also helps to have free time besides work, when nowadays social media have to run 24/7 and customers don’t like to wait. Perfect creation to make work-life balance something real not an illusion. This time we want to show you how to manage your time during the day. First thing first, set goals for each day. Try to separate them in a few days and not put all at once. Goals and task for the day will help you clear your mind and see how much you have to do, which give you a possibility to calculate the needed time. INCLUDE BREAKS IN YOUR TIME MANAGEMENT. It is important to include breaks like for breakfast and lunch. Trying to schedule working out? Organizing time each day you will see when and how much time you can have to make your body healthier. You can also share your calendar with family. It will help you to remember about family events or school events of your child. TimeTree — Have a shared calendar with your family. It is hard to calculate the duration of the meetings same as being stuck in a traffic. Be prepared for unexpected time-consuming. When traveling – keep your mailing updated and try to use this time to organize computer, eat lunch or make done any task that can be done remotely: for example order grocery shopping, make bank transfers, schedule your next day. Take a 15-20minutes power nap. This is the ultimate secret of every successful person: a businessman and the athlete. Sometimes you can’t sleep at night because you were working on this huge presentation. It’s ok. Just remember to rest later. Power nap gives you enough rest that is needed. Remember, NO MORE than 20 mins. Are you scrolling Facebook feed too much? Block it ( kidding ). Just set time you can spend on social media every day, or make them unavailable during working time. You can also turn on notification when you, for example, spend over an hour on a particular website. Not sure if you need it? Try RescueTime to check which website takes your time. Self Control App – A free Mac application to help you avoid distracting websites. Stay Focusd – Limiting the amount of time that you can spend on time-wasting websites. Go F*cking Work – Redirect unproductive sites to motivational messages. 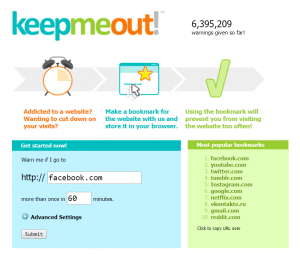 Keep Me Out – Using the bookmark will prevent you from visiting the website too often. Set timer you spend on your email each day. If you’re not working in a customer service, you can manage to look into your inbox a few times a day. Dropping everything because of email notification makes you distracted and tasks are getting harder to achieve, same as your daily goals. To check timing we recommend Toggl – just press play when in your inbox. It also can make you understand how much time you need for other tasks. Another great App is Sanebox – The average employee spends 28% of their day processing emails. To prevent users from wasting time on unnecessary emails, Sanebox separates important emails and summarizes the rest in a daily digest. Features include snooze, automatic attachment uploads to the cloud and quick organization of no-replies. Waking up is the hardest part for most people, it is important to sleep at least 6h. You can try working out in the morning, it is said it helps the day to be more productive. Here you can read about productive day tips. Start the day good and make it count!